The home video of Rodney King's beating turned the incident into a national media sensation. 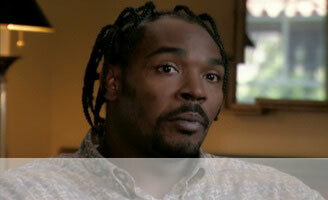 Rodney King in his exclusive interview for the film. The beating of Rodney King by four LAPD officers was a defining moment of the nineties. It caused one of the worst race riots in American history and led to a national debate about police brutality, the fairness of the justice system, and the state of racism in America. Narrated by Robert Prosky. This fascinating documentary tells the story that was missed eight years ago and begins to replace myth with truth. The Rodney King Incident is available for purchase on DVD.